Conor McGregor debuted in the UFC in April of 2013 and fought for the interim featherweight title 25 months later. Given that he recovered from a torn ACL during that stretch, his rise from prospect to champion was alarmingly quick. 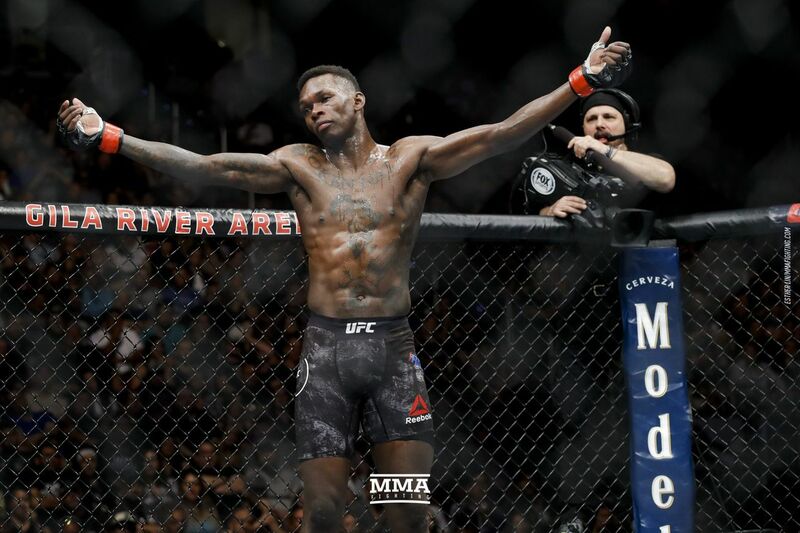 And yet compared to Israel Adesanya — who fights Kelvin Gastelum for the interim welterweight title on Saturday night at UFC 236 in Atlanta — it was a long, drawn out affair. Adesanya debuted just last year at UFC 221. He won a fairly impressive TKO victory over Rob Wilkinson and — because he wasn’t enamored with his own performance — he literally hiked a leg at his effort. Fourteen months later, he’s in the coveted spot to win gold, having traveled through former champions and contenders at warp speed. Like McGregor, he’s getting a crack at a place-holder title in just his sixth UFC fight, yet at this rate he will have defended his title six times before 2020 is through. Adesanya is 29 years old, and plenty used to a busy schedule. When he was kickboxing between 2011 and 2017, he had stretches where he fought nearly every other month. In 2016, Adesanya fought nine times on three different continents. After beating Bogdan Stoica in China he fought twice in one night with Glory less than three weeks later, winning a middleweight tournament in Broomfield, Colorado. The only thing different for Adesanya right now is that his popularity is rising at the same pace as his hand. The fight was a natural springboard to Saturday’s title shot, which Adesanya has been envisioning for a long time. The other part? In the big picture sense, Adesanya has his sights set on being the next transcendent star in the UFC, a must-see attraction on par with Ronda Rousey and McGregor. As an African-born fighter who lives in New Zealand, he knows he has global appeal. It helps that people constantly compare him to Jon Jones due to his wingspan and artisanal striking. It also helps that Dana White mentions his name as the next big star at just about every media stop — a recurring thing that hasn’t slipped Adesanya’s attention. In the smaller picture, Adesanya wants to win the interim title and then the unification bout against Robert Whittaker once he’s fully recovered from abdominal surgery to repair a collapsed bowel. As for Gastelum, who has quietly taken out his share of hyped fighters, Adesanya sees him as the next obstacle in his way. What ultimately happens if everything goes to plan, and he leaves Atlanta with the interim middleweight title? Adesanya says don’t expect the new champion to change.